I have spent my shopping days wandering the aisles of various stores looking for their most pumpkiny of offerings. I assume that my apartment will soon be covered by a thin film of pumpkin spice flavor for the duration of fall. I enjoy pumpkin spice so much that the very talented @Urgoslav made me a gif compiling some delectable pumpkin spice treasures that I’ve posted to my Twitter. So when Lylirra informed me about this thread, I went into a pumpkin spice fueled fury. 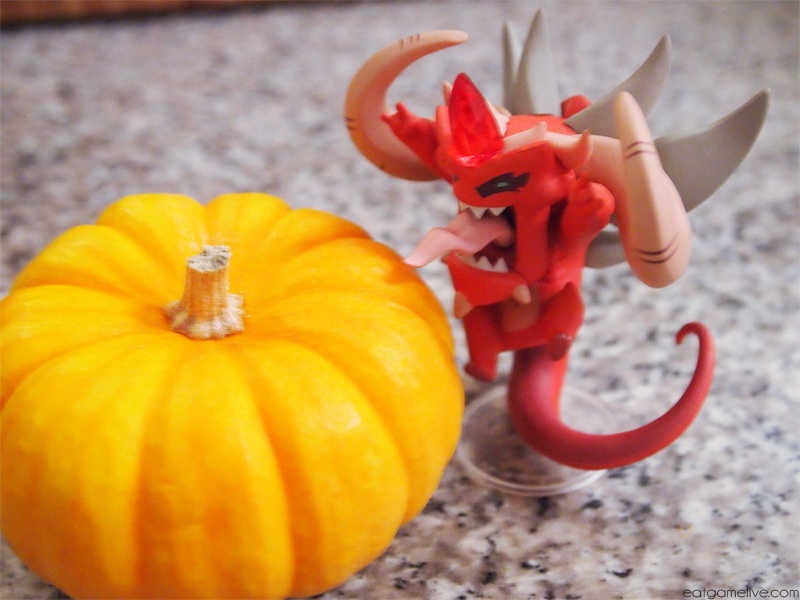 DIABLO and PUMPKIN SPICE? Two of my most favoritest things in the world combined into one delicious and healthy treat? 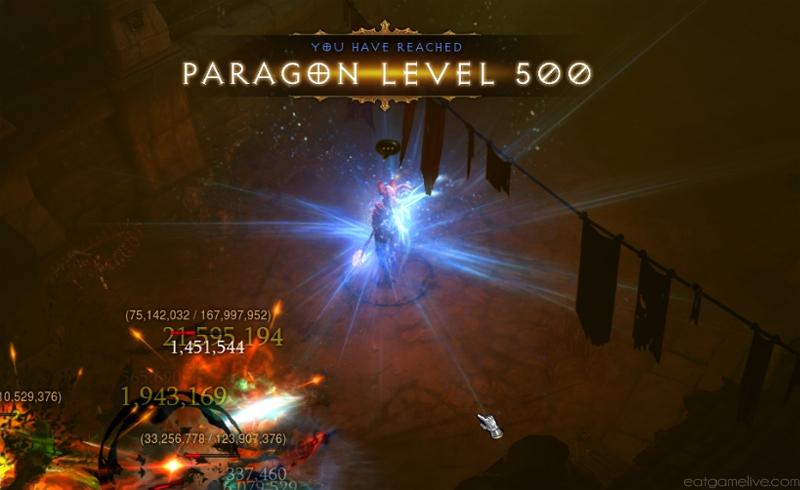 WHY YES, NEPHALEM. Little Lord of Terror makes a new friend! It has been oddly hot here in Northern California, so a refreshing smoothie is something I needed to beat this heatwave. Much like my last bottomless potion recipe, Bottomless Potion of Kulle-Aid, this Bottomless Potion of Pumpkin Spice will also be a very simple-to-make drink. You can also use pumpkin pie spice instead of getting cinnamon, ginger, cloves, and nutmeg. Just use about 3/4 teaspoon of pumpkin pie spice. Prep time for this is about 15 minutes. This makes 2 servings. Combine your cinnamon, ginger, cloves, and nutmeg. 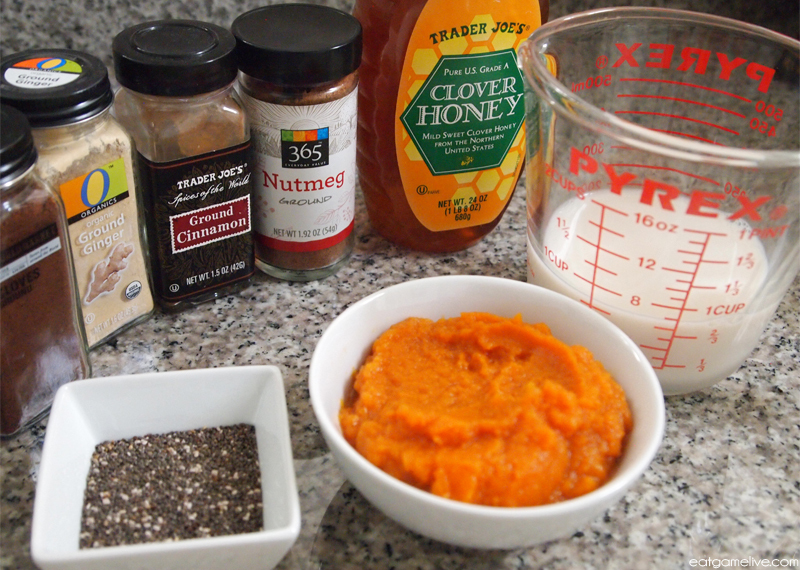 Pour your pumpkin and spices into a blender. Drizzle in your honey. Pour in your chia seeds. 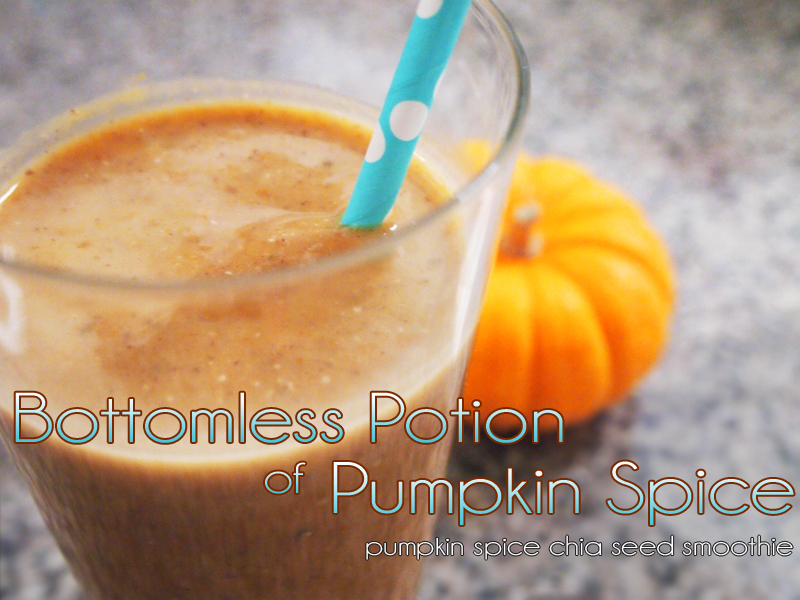 Begin blending your pumpkin smoothie while slowly pouring in your almond milk. Blend until thoroughly combined. 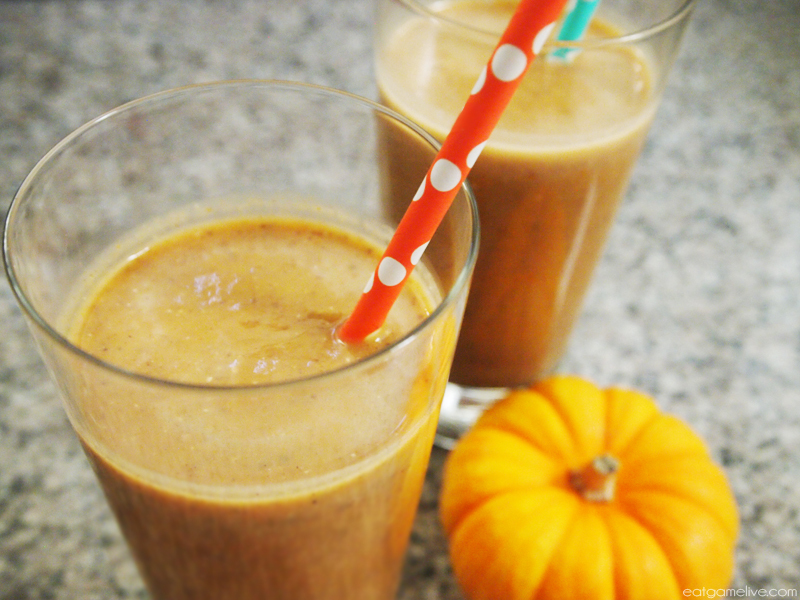 This smoothie will taste like a big ol’ pumpkin pie in your cup. Enjoy it for breakfast, lunch, dinner or anytime you need to quell your pumpkin spice cravings! 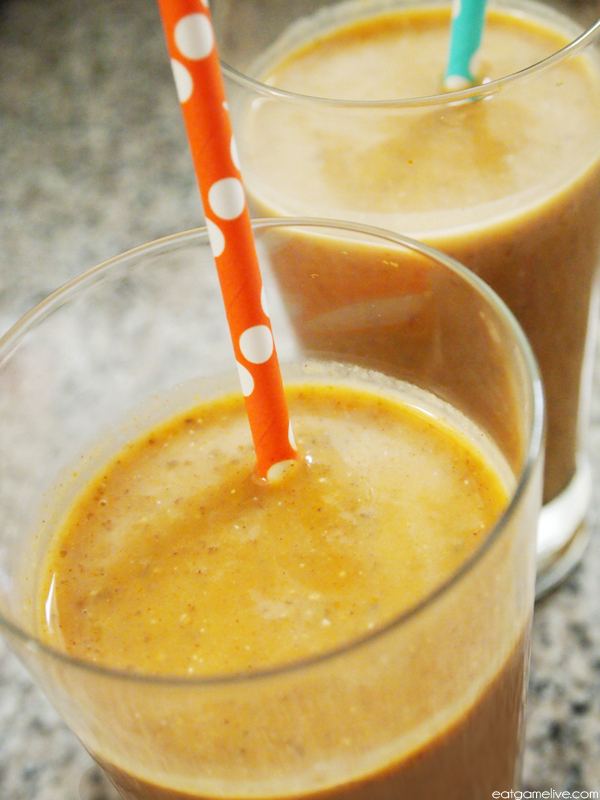 Not only is this smoothie very easy to craft, but it’s very nutritious for you as well. Chia seeds and pumpkin are both full of fiber. It’s the perfect hands-free nutrition you need to squash your hunger while squashing the demons of hell. This entry was posted in diablo and tagged blizzard, chia seeds, diablo, diablo 3, fall drinks, gamer food, gaming, healthy drinks, pumpkin spice, smoothie by admin. Bookmark the permalink. I just made this, and it is absolutely amazing. Thank you for posting it!